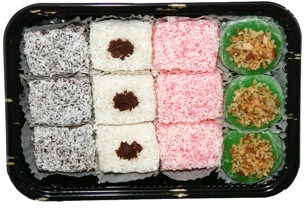 A cute 4-pak of Happy Hearts favorites. One each of Peanut Butter, Haupia, Chocolate Haupia and Hazelnut Coffee Haupia. 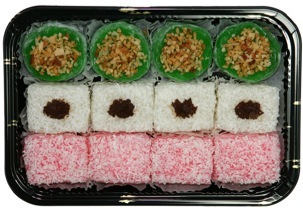 12-piece assortment of our 3 most popular flavors: 4 Peanut Butter, 4 Chocolate Haupia, and 4 Haupia. 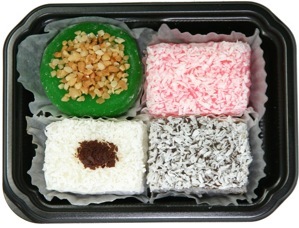 12-piece assortment of all our haupia mochi varieties and peanut butter mochi. 3 of each flavor. 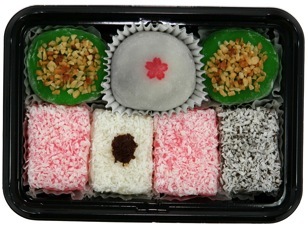 An omiyage favorite for someone special! 1 Strawberry, 2 Peanut Butter, 2 Haupia, 1 Chocolate Haupia, and 1 Hazelnut Coffee Haupia.